Well, we did it. 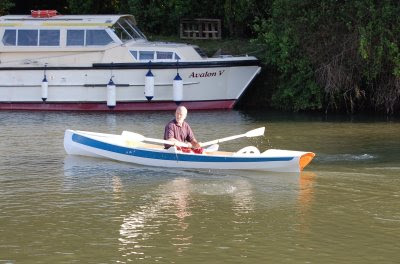 We rowed over 60 miles from Lechlade, close to the source of the River Thames, to the Beale Park Thames Boat Show near Pangbourne. The sun struck me pink, every muscle in my body aches, my hands are covered in calluses and my bum has a boil the size of Berkshire. It was GREAT. For those of you not familiar with the Home Built Boat Rally (HBBR), this internet-based disorganisation (no forms, no subs, no rules) has an abysmal weather record, with almost every event so far consisting largely of people huddling on the foreshore in the driving rain wondering when the pubs are going to open. But last week the weather god gave us sunshine from Sunday to Thursday, and even allowed us to get into Beale Park on Friday under grey skies before the rain set in. Sunday was devoted to setting up at the famous Trout Inn at Lechlade, which we soon discovered is famous for its high prices and basic facilities. I haven't seen a jakes like it anywhere else in England since the 1980s. My dear, the smell. But let's move on. The surroundings were lovely and countrified, just as yer fancy paints, and we set to on the main event for Sunday, the launch of Chris Waite's new skiff Octavia. Octavia uses four sheets of ply, with a few slivers left over. She is built in two halves, so she can fit in t he back of Chris's SUV, the attachment being made by slotting the halves together with a dovetail. The dovetail is stopped from unhitching by slotting in the outriggers, which hold themselves in with a wedge system and bits of string - low tech but KISS (look it up). Even off the water, Octavia is innovative - the halves of the hull fit together to form a shelter, a tarp keeping rain out of the gap. Chris poured a generous libation of Glenfiddich over her bows on the slipway and rowed off with aplomb. She was clearly fast, a first impression borne out over the next few days when Chris would look up over his breakfast of mixed egg, sausage and beans, see everyone was leaving and follow hot-foot, or is that hot-oar? He would inevitably overtake everyone within a few miles. Finally, at the Beale Park show, Octavia was awarded Watercraft's prize for the most innovative design, and richly deserved. Congratulations, Chris.